Somewhere on my reference shelf is a certain book about reggae. It gives a highly positive review of The Best of Wailing Soul, a compilation of singles recorded at the Channel One studio, but it has one complaint. Its complaint is the absence of the single Lawless Society. Well, perhaps the folks at Pressure Sounds took note, because with this re-issue of that great album (which is what this is, in effect), that single is indeed there in all its glory. In fact in more than its glory, because a dub version is included too. Not only that, but dubs or extended mixes of most of the other songs on that album now appear as well, along with a toast each by Ranking Trevor and Dillinger. So yes, if you have that earlier recording then you have the basics of this one. But having the basics is simply not good enough. If you know anything of their origin, you will want the extras. For those who dont know, releases from Channel One imply several great things: production by Joe Joe Hookim, backing by the Revolutionaries, classic period reggae. Then consider whats implied by The Wailing Souls themselves: wonderful songwriting, inspiring vocals, beautiful harmonies. Now ponder the combination: its devastatingly good. Even my re-visit to the familiar tracks was rewarding. In the opener, War, what struck me anew was the galloping rhythm and the uneasy (but explicable) link between the two strands of the lyrics: war in the east, war in the west, oh, rumours of war versus Grandma said penny wise and pound foolish. The gentleness of the tune of Joy Within Your Heart was now more obvious, a perfect fit for the lyrics. In Jah Jah Give Us Life I noticed how good the advice really is (so let us live), along with the busy percussion and nice piano parts. Speaking of instrumental parts, the role of the horn arrangements in several tracks stood out much more than before. And I am now convinced that Back Slider is one of The Wailing Souls most soulful and best recordings. Most surprisingly, I noted how free from clich were the lyrics. These songs date from a time when the Rastafarian and sufferer lyrics that are now standard would have been reasonably new and therefore excusable, but in fact no excuse is needed. Even old recordings can be refreshingwhen theyre of this quality. The album is more than refreshing, it is powerful. Its rhythms burst with energy. Its musicianship is striking. 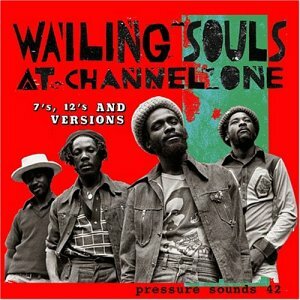 The Wailing Souls created art at Channel One, and you should hear it. Conceptual art comes in two flavors. Theres the upper-case Conceptual Art, the dip-a-thousand-earthworms-in-red-wine-and-align-them-north-by-northwest-on-the-boardroom-table kind, which is not art at all but failed philosophy. Then theres the more modest kind that starts as a concept but goes on to actually produce something of beauty, and thats what we have here with this tribute album. 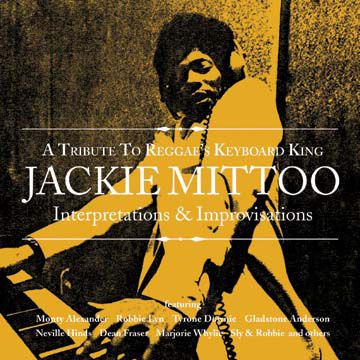 The idea is simple: record a bunch of keyboard players doing what they do best with some Jackie Mittoo tunes, supported by a top-notch band of reggae stalwarts. The organ pieces outnumber piano two to one, although sometimes both are featured. A few performances are fairly straightforward renditions of their respective melody lines, but most are fully deserving of the albums subtitle, Interpretations & Improvisations. So we have flowing arpeggios on piano, swoops and swirls on organ, and vamping chords on both; we have Monty Alexanders jazz, Booker T-type soul and Roger Williams-type pop. Tickled ivories abound. A few tracks highlight other solo instruments alongside the keyboards: melodica, guitar, even violin (and Dean Frasers sax, which although its credited for track 13, I hear on track 12). To take one example in more detail, consider track 17, Darker Shade: over a deep and steady rhythm Paul Crossdale plays the main theme (sounding very much like The Beatles Norwegian Wood) on organ; it turns into a trumpet showcase by David Madden, then back to organ, then to an electric guitar solo by Maurice Gordon, ending with a reprise of the main theme. That small jazz ensemble kind of progression is not typical of the whole album, but the whole album is just as much of a delight. All of this should answer both questions you may initially have had. Q1: Doesnt it sound too much the same? A: No, it doesnt. See above. Q2: If Jackie Mittoo is already well represented in my collection, why would I need this? A: You need both. Theyre different. See above. And oh yes, along with the music you get liner notes with photos and clippings and reminiscences, all bits and pieces of Mittoos biography, none of which (Im glad to see) denigrates his considerable time spent in Canada. So this is conceptual art at its finest: a wonderful concept that brought about a superb musical experience. It bears only a superficial resemblance to the American Idol concept of someone doing someone elses song in some grandiose manner; this one is art. My radio co-host took to St. Catherine in Dub as readily as I did. Maybe thats proof of the claim made in the liner notes that this album is a perfect introduction for the uninitiated to get familiar with this particular genre within Reggae. The notes cite technical excellence and outstanding creativity and innovation,” but to my mind the reason its such a perfect introduction is because it is just so friendly. Friendly. Yet the dub is as strong and uncompromising as one would expect given the source and era involved. So what makes this recording more approachable than many others? Maybe first because instead of disjointed vocals wafting in and out, echoing and reverberatingwhich can be unfamiliar and unsettling to newcomersthe vocals are almost omitted altogether. And maybe secondly because the sound is seldom reduced solely to bass and drums. The combination has produced something more like an instrumental set than other hard-core dub albums tend to be. Thats my theory. Even for long-term fans, the name Ring Craft Posse may not be familiar, but the names of its individual members certainly are. Sly Dunbar, Robbie Shakespeare, Ansel Collins, Lloyd Parks, Tommy McCook, Dean Fraser, Bobby Ellis, Winston Wright, Augustus Pablo, Earl Chinna Smith: these and other reggae stalwarts were brought together in various permutations by producer Rodguel Blackbeard Sinclair during the classic years of roots reggae. The resulting tracks were mixed by Ruddy Jah Thomas, and are available for the first time on this CD, encased in a beautiful glossy centerfold package. It even includes an old map of Jamaica showing the parish of St. Catherine, from which the album gets its name. 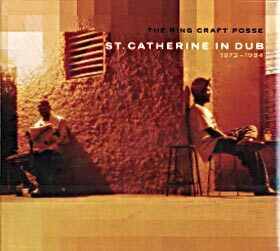 Curiously, the 14 tracks are named for districts within St. Catherine, therefore a title like West Bay cannot convey its pre-dub origins, in this case an old horn-driven Burning Spear song. But who needs such extraneous info with so much else to pay attention to? The quick shuffle Garvey Meade has a busy arrangement with swirlings and clangings; I think they managed to get the kitchen sink in there too. Cumberland has wonderful dynamics, its gentle organ somehow yielding a pleasant tune despite the dub effects; the aggressive Waterford, on the other hand, features lots of bashing of drums. Bridge Port is adventurous in its jazzy extended notes. Not until track 10 do vocals start showing up, which they do as short bites of sound rather than as lyrics. The only words conveying meaning of any sort come in the second last track, when love one another is clearly discernable. I like that. In fact I like the whole album. Creative dub, yes; technically excellent dub, yes. But user-friendly dub, ahh, thats the key to this one. 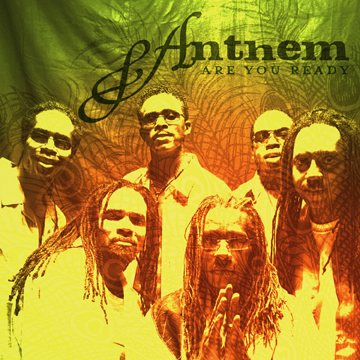 Anthem struck me as a strange name for a reggae group. I looked up anthem in the dictionary. The first meaning is a song or hymn sung antiphonally. I looked up antiphonal. Has something to do with portions of choral music sung alternately, one portion in response to the other. Hmm, I thought, it fits after all. Good name. material in between. And on the one cover song, of course. Gal a Worry provides a fun kick-off with its two interacting DJs and clapping percussive effects; three more enjoyable quick tempo tracks follow. Then comes the lovers rock of I Tried to Resist,” similar to and just as effective as Third Worlds excursions into the slightly saccharine suburbs of soul. I like the next love song better: pretty melody, complex rhythm, nice sax solo. The faster title song is a real highlight; someone had fun writing the lyrics (I got to take my chances with romances), and the overall production manages to produce something light-hearted yet substantial. Phil Collins Another Day in Paradise is the cover tune, and they give it a passionate delivery with an added toast for interest. Anthem keeps up the momentum in the last third with some of their strongest material. Your Money uses witty rhyming couplets to caution us about what she is really likesomeone had an unfortunate affair of the wallet, apparentlyand has an unusual and creative instrumental break in the middle wherein everything crashes down, falls apart and disintegrates, after which an ominous vocal picks up the lyrics again and takes us back into the song. Great stuff. The album concludes powerfully with The Call: beginning as a simple song with solo voice over strummed acoustic guitar, it turns into a hymn complete with churchy organ and pious thoughts (Behold the call Jah Jah peoplehes calling to you), and concludes as a very rich production including electric guitar and the whole shebang. It should be obvious by now that dynamic vocal interplay isnt all that Anthem has to offer. They also give us strong songs with (mostly) intelligent lyrics, skilled playing on their instruments, 52 minutes of varied styles and arrangements, and lots of energy. Not bad for a group with a name that denotes antiphonal choral singing. Zion Man took me aback at first. In fact I disliked it. It sounded like reggae, sort of, and I love reggae, but I didnt like this reggae. And the problem, or nine-tenths of it, was Ras Chico Blounts unique vocalizing: is it singing? Is it toasting? Is it chanting? I dunno, but it certainly is striking. And is he in tune? Does it matter? Does he care? Again, difficult questions. I almost like the album now. Not fervently, but enough to want to put it on occasionally and enjoy it when it is on. Repeated listenings allowed me to come to a truce with Blounts voice. True, it can be weedy; it can be fragile; it often sounds removed from the here and now, as though above, or at least outside, such worldly concerns as emotion. Yet the voice obviously works on some level, because it commands attention even as it offers advice or preaches a version of Rastafarian teachings. On Original Songs the vocal is halfway between an extended grunt and a slow chant, but again, it works. My repeated listenings also brought rewards having little to do with the vocals. The many highly unusual rhythms, for example, depend only partly on basic drum and bass, stressing additional percussion insteadhighly imaginative percussion at that. The lead track is just one example where the percussive rhythm is the central concern, while the vocal, instrumentation and tune are peripheral. The four-plus minutes of Mystical Revival are dominated by a repeated chiming tone. In Dont Let Them, a controlled vocal calmly belies the frantic pace of the percussion. There are other rewards too, among them the song Dont Give Up, with its tunefulness and catchy chorus that features a dynamic call and response between the male lead and female backup. Its a lyrical and musical highlight. Rain Clouds is also strong: gentle vocal, tasty guitar picking on the bridge and a great moving bass near the very end. Empress Ne-Ne is the featured vocalist on an early track; her mannered approach nicely aligns with Blounts own. And the nyahbinghi drumming of the final track, Message, suits the laid-back vocal style perfectly. The most striking ingredient of Zion Man may be the peculiarat times peculiarly effectivelead vocal. But the most satisfying ingredient is the inventiveness of the arrangements, particularly the percussion. If only other reggae albums showed half the rhythmic imagination of this one, reggae fans would have true cause for celebration. Goods Gonna Happen somehow gets a little better every time I hear it, revealing more of itself with each listen. How this happens, I dont know. Perhaps Sahra Indios music is more sophisticated than Im used to. Or perhaps it has something in common with the masks she makes: masks always play with the concept of hiding yet revealing. Yes, that must be it; some of the contents hid from me longer, thats all. What this album showed me first was its pop-oriented side, as represented by the heavily produced title song and by My Heart, with sound too sweet, arrangements too slick, lyrics too trite. Then it revealed the melodic catchiness of Bush Mama, whose swaggering premise no longer bothers me, and the dancehall catchiness of Yard Academy, about the simplicity of home and faith. Eventually I noticed the interesting lyrics (theres a stone loose in your foundation/it could be your demise) of Rude Boy Tactics, along with the songs jazzy inflections in both vocal and keyboards (jazzy, but not jazz: think Steely Dan, not Miles Davis). Things were definitely looking up. Next, the album showed me how contrasts can produce powerful music. In Dogtown, Sahras strong but very feminine voice is set off against a short, friendly, rough and sloppy male rap, and it works beautifully. Put down the M16/destroy those killing machines, she sings in another song, her initially dispassionate vocal quickly becoming involved while a stinging, wailing electric guitar creates tension, the whole thing remaining catchy and upbeat despite it all. Finally, the album revealed well, that part has yet to come. Who knows what else I will find there? So let me end with several incidental notes: A special thanks to Ricky Rouse for his expressive electric guitar. The album clocks in at 40:42, but there are only 8 different songs, short spoken bits claiming the other 4 tracks listed. Credit is given for programming and sequencing, although the music sounds natural enough to me. The album closes with an instrumental version of the title song, and despite it being lightweight, I like it more. All in all, an interesting album. A highly revealing one, too. Isouljahs is a(nother) USA home-grown reggae group on an independent label, out to make its second major statement, out to entertain and inspire and make us dance. Crucial Roots gives the band members a comfortable vehicle to do that, roomy enough to show off their instrumental licks, their flexibility within reggae sub-genres, their songwriting, their vocalizing, and their Rastafarian faith. They bring a couple of guests along too. Yes, the band is out to prove itself, and it does a fine job. With 17 titles listed, the album may look bloated, but when you discount two brief dialogues and one momentary touch of nyahbinghi, 14 actual songs remain. A couple are little more than extended grooves, but it all makes for a very pleasant round of you-name-it-and-its-probably-there reggae. Starting with the title track, a strong one-drop rhythm anchors a pleasant tune as a passable vocal dispenses vague Rasta pronouncements, all accented by a nice horn arrangement. The next song, Positive Life, picks up some of the lyrical clichs left unused, and adds an appealing keyboard riff. The following number tells us that the truth is revealed. So it goes. The highlight may be the tuneful, sprightly Mr. Musik, which is defined by old-fashioned ska-like horns and piano; the accompaniment is simple and the rhythm is strong. The dancehall-styled Rasta Youth is almost as good, with enthusiastic vocals alternating between singing and dj chatting over an active piano and organ background. Greetings Bredda Pablo is a melodica instrumental, an obviously sincere tribute to Augustus Pablo, and it is a real treat coming in the middle of the set. A nimble chat about the healing of the nation, Green Herb, is surprisingly effective over its subdued instrumental backing. What else? Well, we get a girlfriend described as princess, empress, duchess and queen (oops, sorry, not duchess, they forgot that one); a freedom is a must lyric; various dub effects, and an oddly fragile vocal to an unadorned nyahbinghi hymn. The album concludes with the instrumental Ras Tai Chi, an interesting concept given that its rockers rhythm moves a bit too fast for my perception of what Tai Chi is all about, although true enough it is repetitive and trance-like, lasting just over seven minutes. 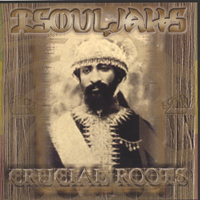 Overall, Isouljah offers very pleasant reggae, from Rasta roots through to dancehall toasting. Not too much of it has not been done before, but that is not to deny the pleasure to be found here. And thats about it. If I sound unexcited by Crucial Roots, well, I am. The cover art is a joy to behold: five grinning, grimacing, grotty cartoon faces (caricatures, probably) competing for not much space. That signifies fun, and the album behind the cover indeed delivers fun. But fun is only part of whats going on in Nothing To Proove. Theres also the bad spelling. Actually, theres even more than the fun and bad spelling. Whats on this disk is complex, inventive, catchy and highly musicalall without ever leaving the groove behind. I like the way the various parts of each song (average length: 5 minutes) are conjoined. What would be discrete movements in a longer compositionlets say a symphonyare effortlessly united here. Its remarkable. 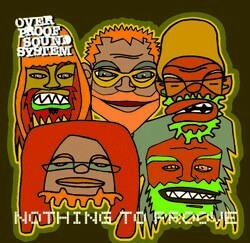 And you thought Overproof Soundsystem was just a bunch of funny faces. The first track, for example, starts in a dancehall style with a couple of DJs bouncing back and forth; its entertaining but unremarkableuntil the 2:48 mark, when it veers unpredictably into dub territory. Track two reverses the order, changing abruptly at 0:37 from dub to dancehall; we then get a confident guest vocal from Ken Boothes son Kenijah delivering lets all unite lyrics; the dub returns around the 4 minute mark and lasts three more minutes. Track three is introduced by an amiable acoustic guitar (intermittently revisited), but then goes into a unique interaction between instrumentation and DJ; another voice enters; fast chatting then combines with the singing, and were still only at 2:40 when the dub starts. Thats enough about how the soup is stirred. Onto a few of the tasty ingredients. Such as the excellent musicianship and fun interplay among the elements of Got To Be a Way, which gives me the same invigorating feeling as when Ravi Shankar on sitar and his tabla player gather momentum towards the climax of a piece, both finally interacting at breakneck speed. Such as the chicka chicka vocal in Get With It. Such as the rockers rhythm and classic roots harmonies of Fussing and Fighting. Such as the bashing drums of track seven, the tinkling piano of eight, the beautiful echoes of Ijahman Levi in nine and the sparkling instrumental workout of ten. The confidential, whispering vocal halfway through track 11 is both appealing and involving, while track 12 has a strong performance from guest vocalist Cheshire Cat. There. Although the lyrics are bland, the rest of Nothing To Proove is fun. But its never silly. I would even say its extremely mature. Overproof Soundsystem treats the reggae of old with a playful respect and approaches the contemporary kind with a respectful playfulness. Sounds good to me.